Researchers with the University of Florida Institute of Food and Agricultural Sciences have developed new tools to teach students about invasive plants. 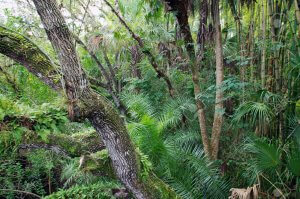 View of tropical forest with a variety of plants and trees in tropical south Florida. A 16-minute video, “Silent Invaders,” allows teachers to introduce students to the concepts of invasive aquatic plants and their management with examples from across the United States. Additional teaching tools include a Teacher’s Guide, Teaching Points, Keyword Chart and Definitions, and Guiding Questions suitable for upper elementary, middle school and high school students. These tools align with Next Generation Science Standards and Common Core Standards.